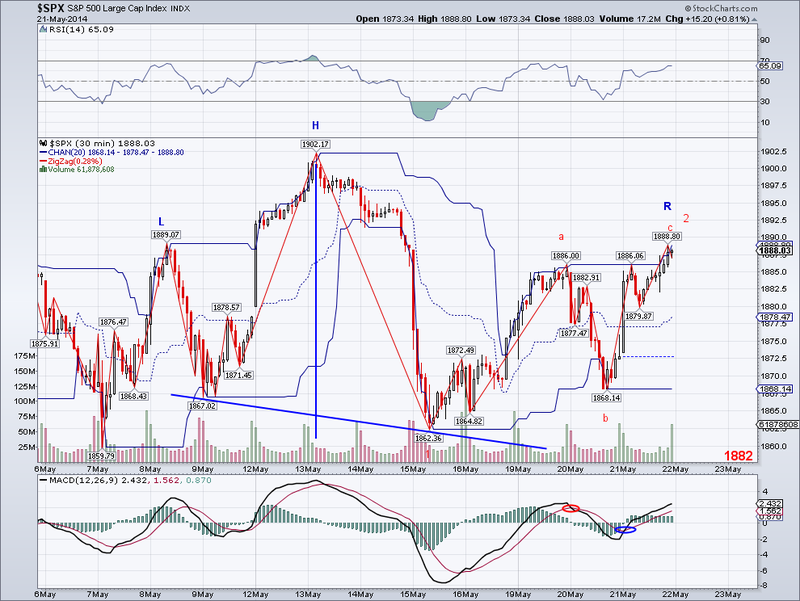 The market has continued to extend its bullish 3rd wave and the original target has basically been reached. I am still expecting a W4, so this wave looks like it is going higher before any substantial correction by the time it's completely done. After going up 30% in 2013 and almost 4% in 2014, the market hasn't really bothered to pull back. However, I believe a higher degree W4 correction is coming sooner rather than later, specially given the fundamental background. Summer is almost here and I'll be surprised if the bulls manage to keep it up, but as I've said before, expect the unexpected. I don't have much time today to write as I am on my way out. But basically, the W4 I was hoping for has not materialized and instead I see the W3 extending. The market is already close to my original target for the complete 5 wave structure, so if we get 5 waves we will probably see the market reach into the 1930's. I bought back some of the short positions I sold on Tuesday in case we do get a W4 in the next session or two. The market made a marginal new all time intraday high and I'm looking at 1902 as the target for W4. 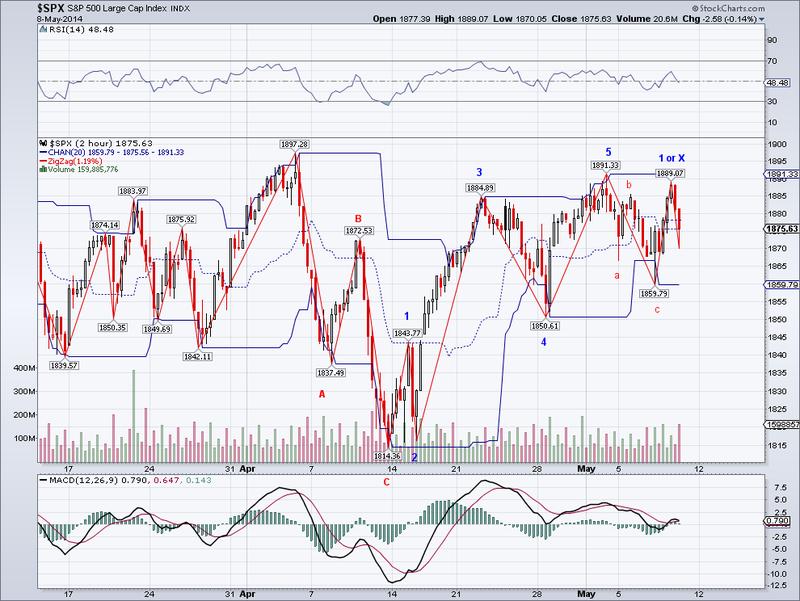 Another wave around the same length as W1 and the market should be in the 1920's and ready for a stronger correction. The question of course is whether we will a substantial correction to the 200 DMA at the very least or just another test of the Trend Average or 50 DMA and see new all time highs again. I will probably buy some longs around the 1902 level with a short stop and then hopefully buy back my short position if the scenario I described materializes. 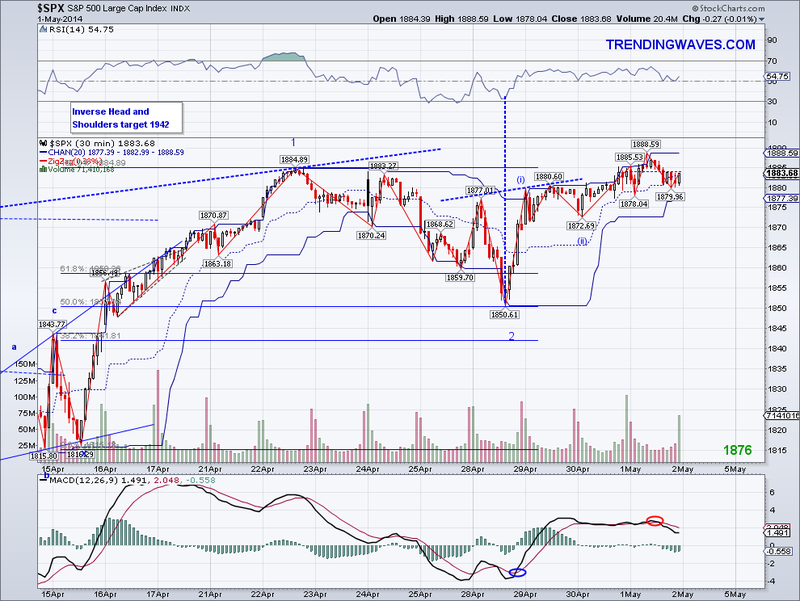 The Trend Average was right and the market invalidated the H&S pattern I was tracking and trading. It is clear now that we are seeing a bullish W3, so I did some calculations and I have a 1925 target for the wave that started at 1862, so we should see the W4 tomorrow or Thursday. The previous indexes that lead the sell off a few weeks ago are rallying, and if their momentum continues, we will see a sustained rally on the SP500 for some time. However, I still see the market in a Rising Wedge in the longer term time frame and I'd be surprised if we don't get a summer correction at all. I stopped out of my short position early today and will consider re-entering if the market gets to the 1925 level. Anticipating a trend change is always hard but at that level there will be enough of a deviation to enter a lower risk short targeting at least a test of the TA. For now, I am all cash and waiting for an opportunity. The market came within a point of making an all time high and the H&S pattern looks like a failed pattern at this point. At the same time, we need to see a strong bullish W3 to break out of resistance and clear the range the market has traded for the last few weeks. I posted a daily chart to point out the Rising Wedge in place, a break of the trendlines on either direction will point to where the market is headed in the next few weeks or even months. 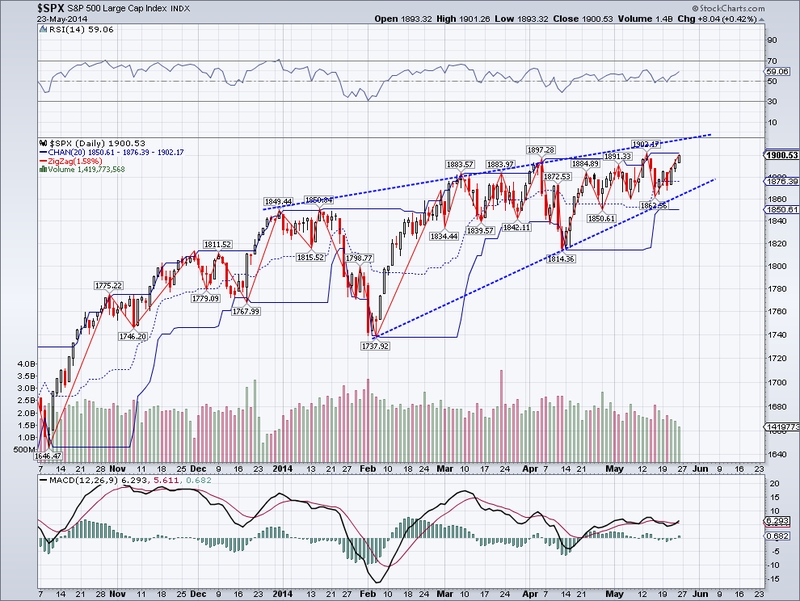 But as a pattern in itself, the Rising Wedge or Ending Diagonal is a bearish pattern. I came close to stopping out of my positions. And in all likelihood, the market will probably make another all time high next week but until that happens, I am staying put. I guess it makes the long weekend even longer! lol. The Head and Shoulder's pattern I have been following and trading is hanging on by a thread as the market pushed past the 1885-90 resistance and stopped at the last resistance before the all time high at 1897. 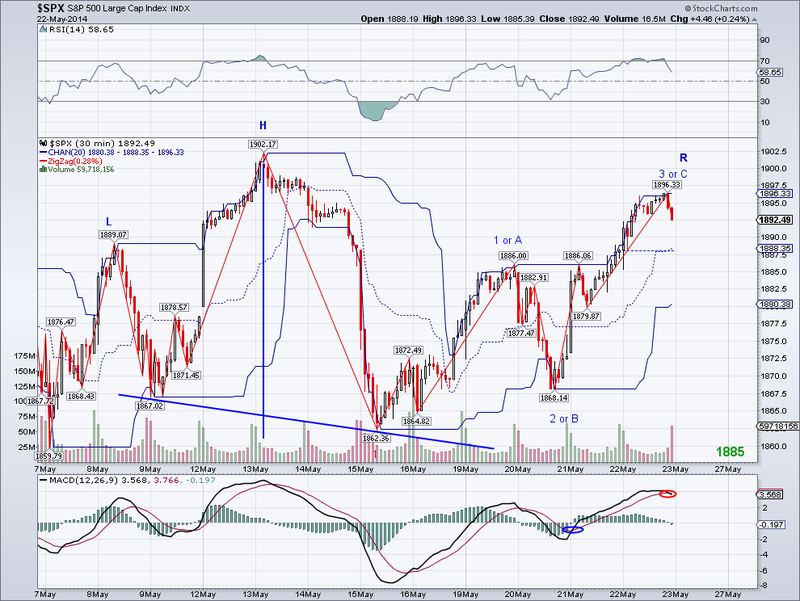 The waves from 1868 can be counted as n ABC move with strong selling to come tomorrow or Tuesday. But with the Trend Average back to green this same count could just be part of a bullish 5 count that will break out of range and set an all time high in the next session or two. I am staying put with my positions but will plan on exit them if an all time high is reached. No point in fighting the trend or market euphoria if the H&S pattern fails. 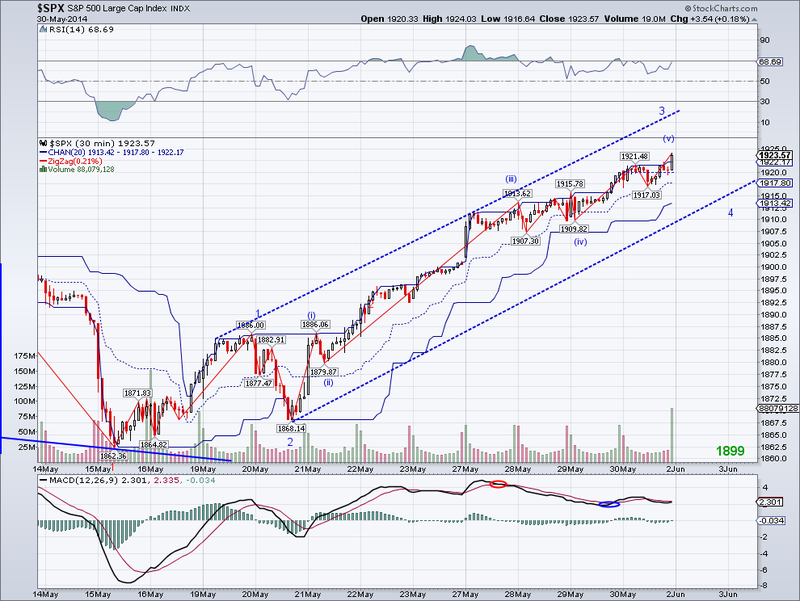 The market closed again at resistance and I think we are about to see a substantial move. The H&S pattern remains in place but the market managed to turn the Trend Average bullish today, so I am hoping the signal will get whipsawed. I think we'll get a better picture before the long weekend. I am staying put on my short positions until I see a reason to sell. The market started to sell off as I had been expecting but I'd like to see the selling break the neckline of the H&S formation to verify the pattern and the waves. 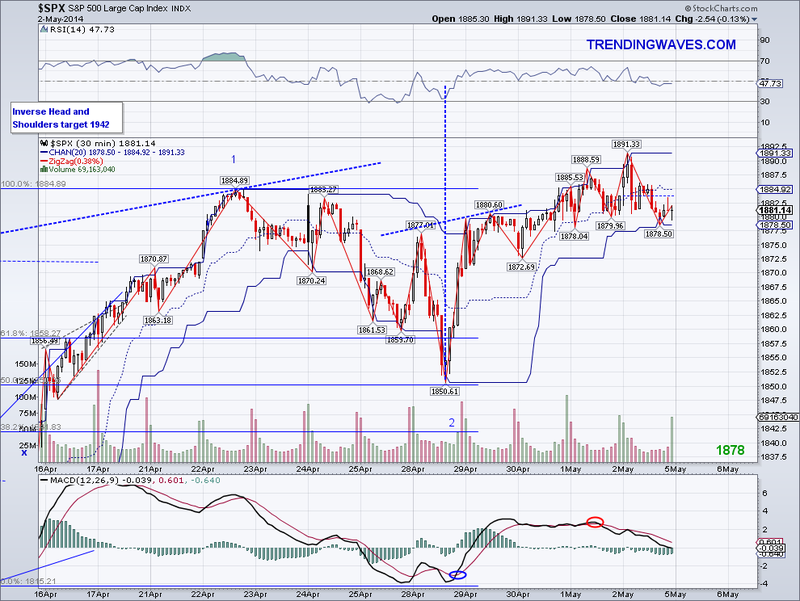 The SP500 bounced right off the 50 Day MA and it could maybe put in another shoulder for a "complex H&S" formation. However, the DJI which had been leading the market since April lows closed under the 50 DMA, which it hasn't done since early in last month. Also, the Nasdaq has never been able to recapture its 50 DMA ever since it first started to sell off, so it is likely the SP500 will do the same. May is coming to an end and the World Cup starts next month, so it is the perfect time for bears to come out of hybernation. I am staying put on my short positions until I see a good level to take some profit/position trade. 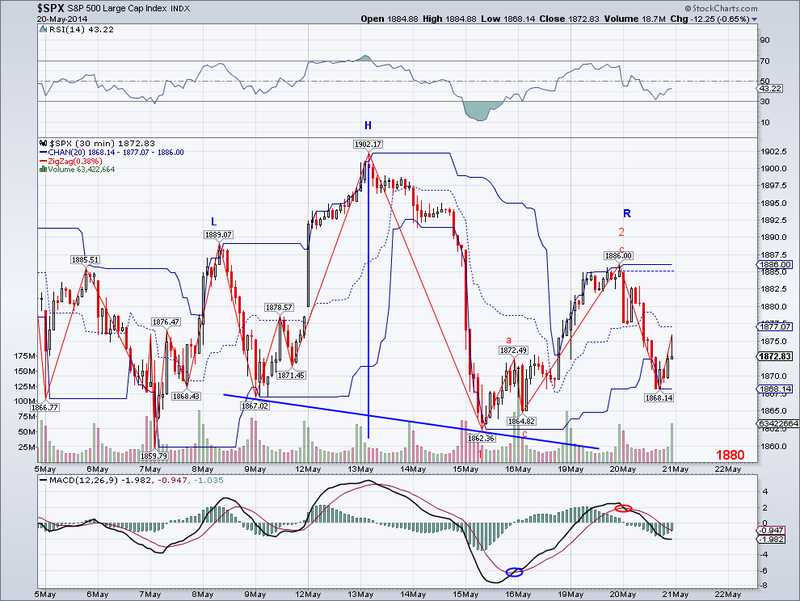 The market continued to rally today and we now have the right shoulder of the H&S at an ideal level. 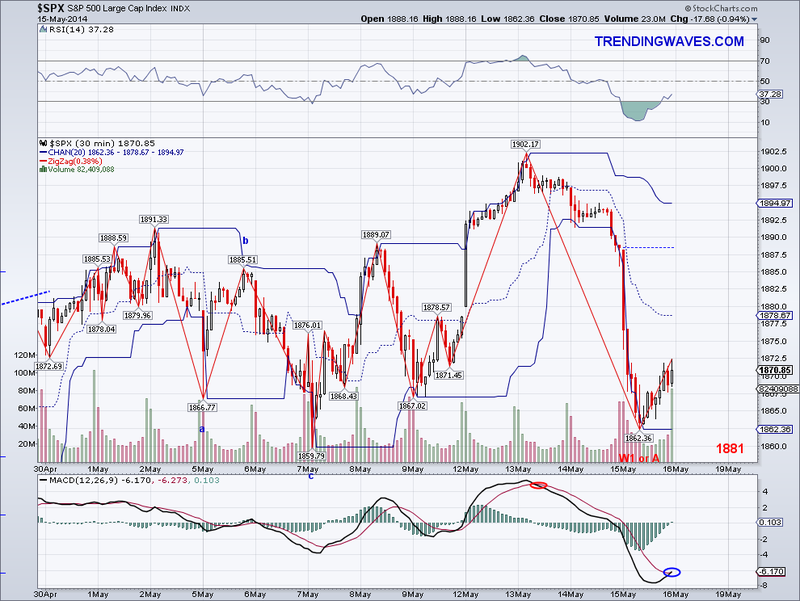 So if this pattern materializes, we should see the selling start in the next session or two. Obviously, there is a failure probability but I am hoping the market will be kind to me.. lol. The market closed above the Trend Average so the ST trend is being challenged but the market is right at the 1885-90 resistance and needs good bullish momentum to overcome this level. 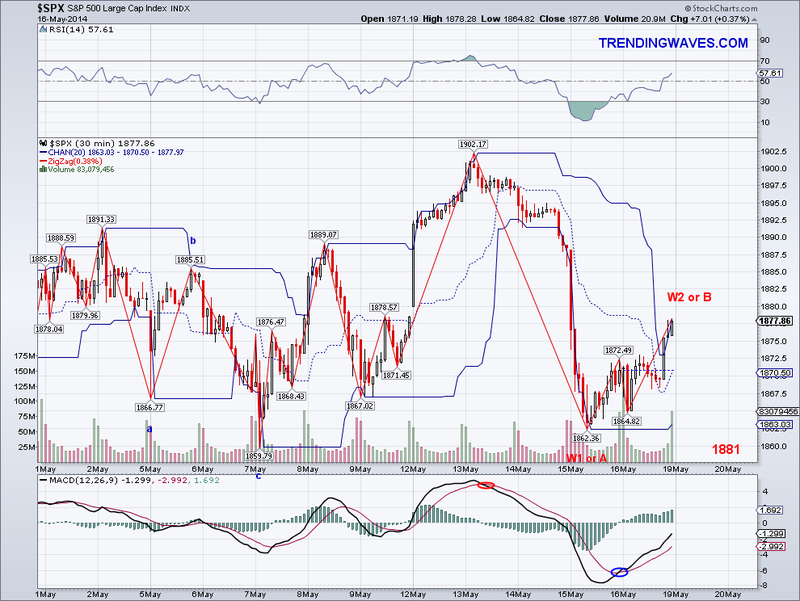 The market bounced today as expected and has formed a right shoulder of an Head and Shoulders that targets 1827. The bounce could go up to 1885-90 on Monday before another bearish wave that will break the 50 Day Moving Average for good. If the 50 DMA is lost decisively, chances are the market will visit the 200 DMA sometime in the next few weeks. The only thing that can change the bearish set up at this point is a rally to turn the trend back to positive and make another all time high which looks unlikely to me at this point. But obviously, I'll prepare for the unexpected as nothing is 100% in this game. 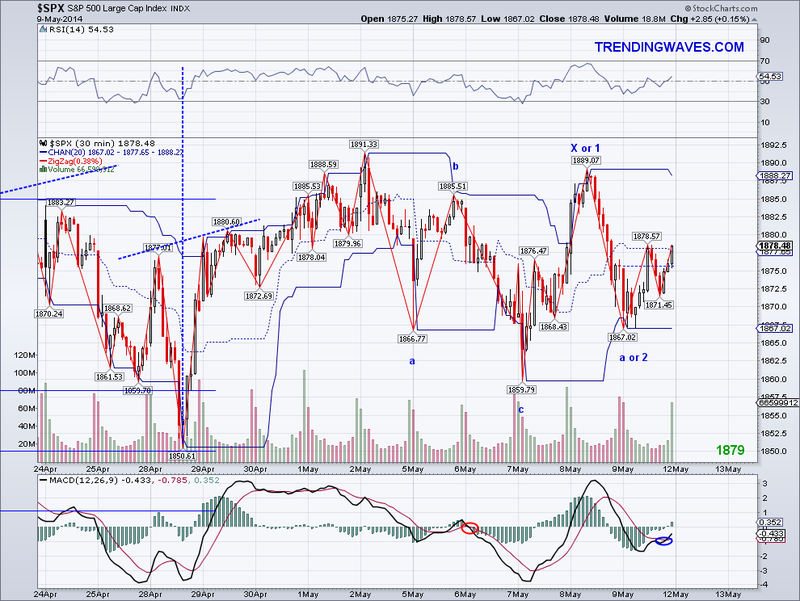 The market sold off today and eliminated the potential bullish count I had been tracking. Also, the level I mentioned yesterday was breached which now sets up the potential formation of a Head and Shoulders if we get a counter rally to test the Trend Average tomorrow (which has gone negative). If the market fails to recapture the TA, the next bearish leg will slice through the 50 Day MA which in turn will probably start a substantial correction. I started selling the rest of my longs in my Short Term portfolio to raise cash and will add some shorts at the test of the TA with a stop at the all time high. You guys know I rarely call for tops but probabilities are no longer favoring the upside after today. The bulls would have to make a strong reversal day to change my mind. The market pulled back today enough today for a W2 so I removed the micro count labels to make it more simple. Technically, one could argue there were 5 waves completed yesterday at the 5 minute level so I am not going to worry about that too much right now. What we have to look out for is the possibility of a bullish nested 1-2 as all indicators are bullish and calling for higher highs. However, any further pullback must not breach 1867.02, if the market gets even close to that level and bounces from that level it will be forming a potential Head and Shoulders and possibly start the summer correction. I ended up position trading my hedge today and hopefully I'll be able to improve my cost average on it in the next few days. "The ideal target for the C wave is 1812 (which implies a correction and a resumption of the bullish trend)"
"However, a counter rally that reaches 1872 will be setting up the market for the resumption of the bullish trend and consequently new all time highs." But now that we have an all time high things can get interesting in the next few weeks. If we go by wave count alone, if 1859-89 was W1 then I expect 1935 more or less for the completion of this particular structure. At that point we could see the start of a summer correction, which we seem to get almost every year in May. Also, there will be a multi-month megaphone pattern which makes the correction almost too predictable. 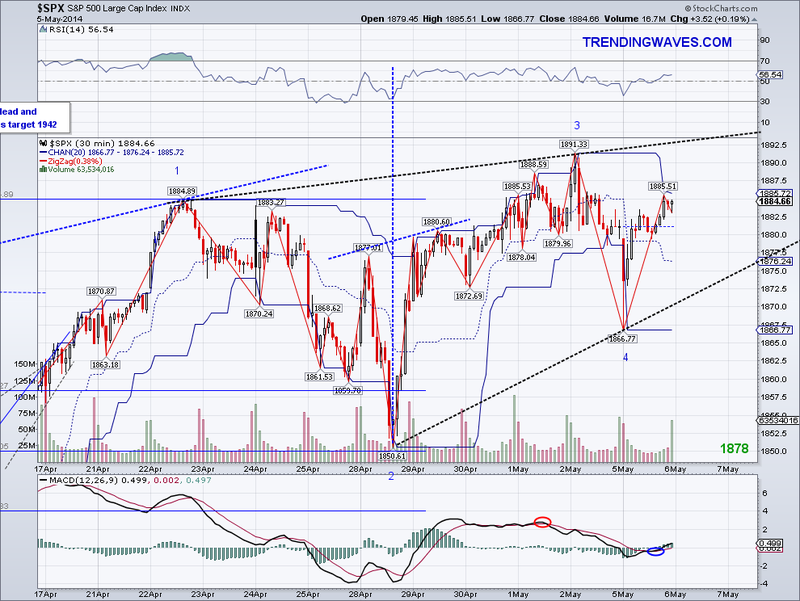 Now, the big IF question is what if the wave from 1737-1897 was a W1. If that is the case, we will not get a summer correction but rather a very strong summer rally where we see the market rally to 2130 before really taking a break. That might sound crazy to some but who would have guessed less than 2 years ago the market would be at 1900? remember back then the talk was about a bearish "Primary 3" to 300-400 that managed to ruin a good number of orthodox Elliott Wave followers who were short with all they had against the trend. So I won't be surprised if the market gets there as I expect the unexpected from this euphoric market. I welcome whatever the market decides to do as the Trend Average will keep us on the right side of the trade. The market finally revealed itself today by launching a bullish W3 to all time highs, falling short by less than a point in the cash market but putting breaking the all time highs in after hours. The DJI also put in an all time high as well so this clears up the count a bit and confirms what I had been saying since the "perfect ABC" to 1812. The rally also shows just how much the market cares about Russia. So next time we see Russia in the headlines remember that it is just an excuse to sell and nothing more. 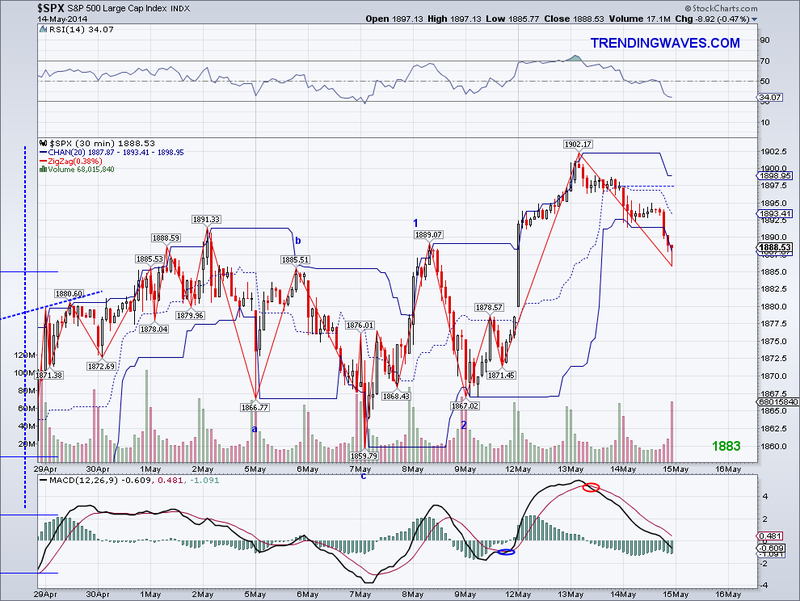 With this said, this bullish 5 wave count might be it for a while. I've been expecting a W4 correction since Nov 2013 and there's a good chance we'll get it after the bulls go on vacation to enjoy their gains. I will be looking for the 200 DMA on that pullback, which btw I think will be healthy for the market so it can consolidate and rally even higher by the end of the year. I am keeping my hedge in the meantime while I hold to my longs. My goal is to sell these positions by the end of the 5 wave count to position trade or raise cash. Also, I wanted to thank everyone who has wished me well and have given me feedback on the new site. To be clear, I am not planning to change anything in the way I blog or cut back on anything on this blog. What I am planning to do is to give market trend and wave analysis to the NASDAQ, RUT, DJI, Oil, Gold and Silver on the new site twice a week which again is http://www.ewaveanalytics.com I have never really done the calculations on those markets and in a way it will be better now because then I will be on top of all markets and identify important pivots that affect the overall market. Had I been following the NASDAQ for instance before the last correction started, I would have been able to get defensive earlier on the SP500. The market came close to the 50 DMA before bouncing back and if the scenario I posted yesterday is correct then we should see another wave down to complete the zig zag or a bullish leg to 1880-85 that gets reversed again to test the 1859 level. The alternative is the low today was a W2 and we will see the beginning of a bullish W3 that will break 1885-90 for good on Monday or Tuesday. The market closed under the TA again but since the downside has been so limited the TA is still rising so there is no change in that signal yet. I sold the longs I bought yesterday again toward the close of the day and but I am staying hedged unless I see the market trade above the Trend Average. These sideway moves are hard to nail so the best thing is to "buy insurance" through hedging. I think the market is approaching a significant turning point soon, as in a bearish turning point so whatever profits I make from the long side will be used to build a short position. The daily MACD is about to turn negative and any more failed attempts at taking out the all time high will give way to selling so I am getting ready. Last but not least, I am announcing a new site which I am a partner of. This site has multiple analysts collaborating to come up with a consensus on where the market is going next. So it takes into account my trend analysis, Elliott Wave counts of larger degrees and Algorithms which are not published anywhere. The site is http://www.ewaveanalytics.com and I welcome any feedback or questions you might have on it. Have a great weekend and Happy Mother's Day to all the trading moms! The market rallied as I had expected but the reversal at resistance raises some doubts. 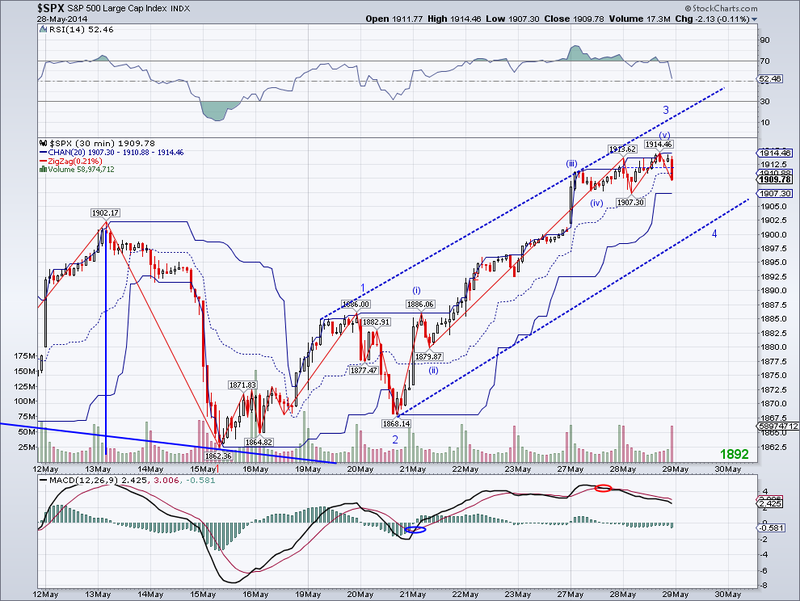 So I am posting the 2 hour chart to "zoom out" and look at how I am counting this at the intermediate time frame. 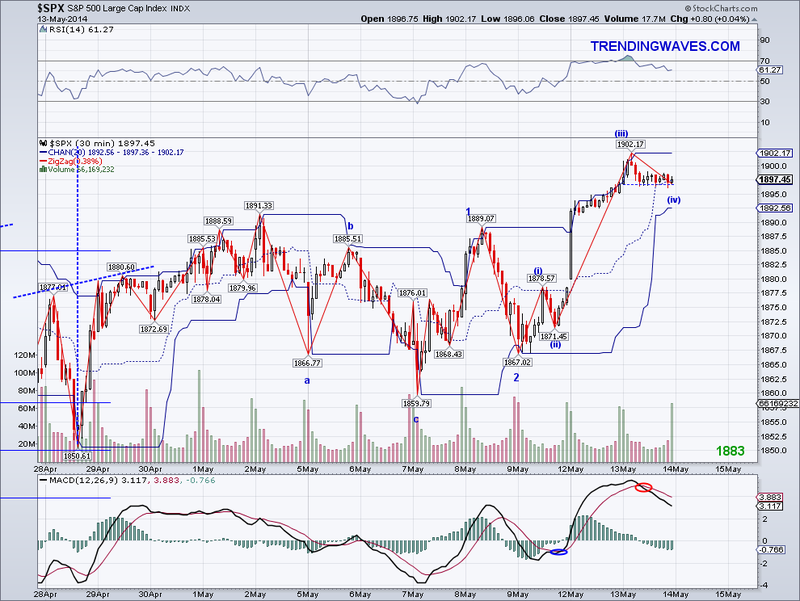 Basically, There is a proportionate 5 wave impulse from the 1814 low after an ABC correction. We got another ABC at a lower degree and today we were supposed to see a W1. However, today's wave failed to meet my minimum standard as far as wave structure goes in relation to a W1. 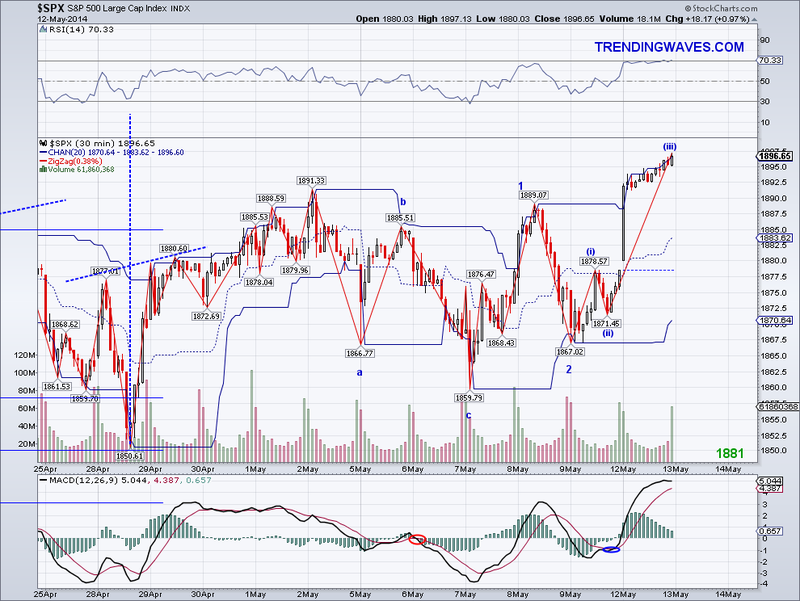 So I am inclined to think we saw another zig zag for an X wave with another ABC move coming. And since the high today was very close to the 1891 high from a few days ago, another proportionate ABC move should put the market in the 1850-59 area. I will be looking out for a 50 DMA bounce if the bearish wave from today continues early morning, with that being the A wave. If the marker bounces towards 1880 with no further downside then that should be the B, with today's low as the A.
I sold the longs I had from yesterday at the 1885 resistance so that turned out well. And after seeing the market turn back and close slightly under the TA, I bought back a small long position and VXX to hedge it. I will go all long again when key support gets tested again or sell the long position I bought today at 1880 more or less. 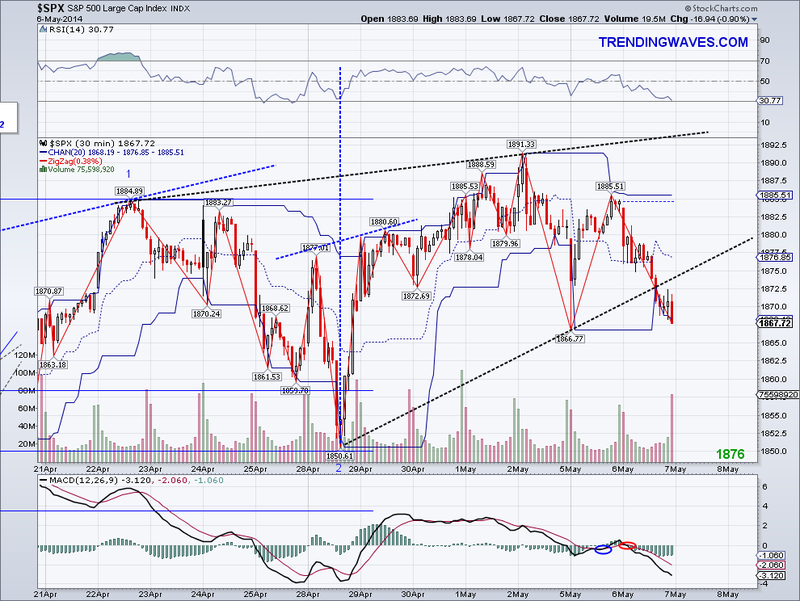 The market went for the 1859 support early morning and it rallied from there as I had expected per my post yesterday. The waves have been difficult to label lately due to all the overlapping waves, however I think we now have a clear ABC on the micro count that favors an impulse rally to 1900. Just as I had speculated on a perfect ABC to 1812 few weeks ago and where the market started its current rally, I see the same exact pattern from the 1891 high at a lower degree. The A leg is exactly the same as the C leg and the bounce looks impulsive, forming a micro Inverse Head and Shoulders than targets 1892. But obviously, this count needs confirmation in the next session or two with either a gap up or a strong bullish reversal without breaching today's low. 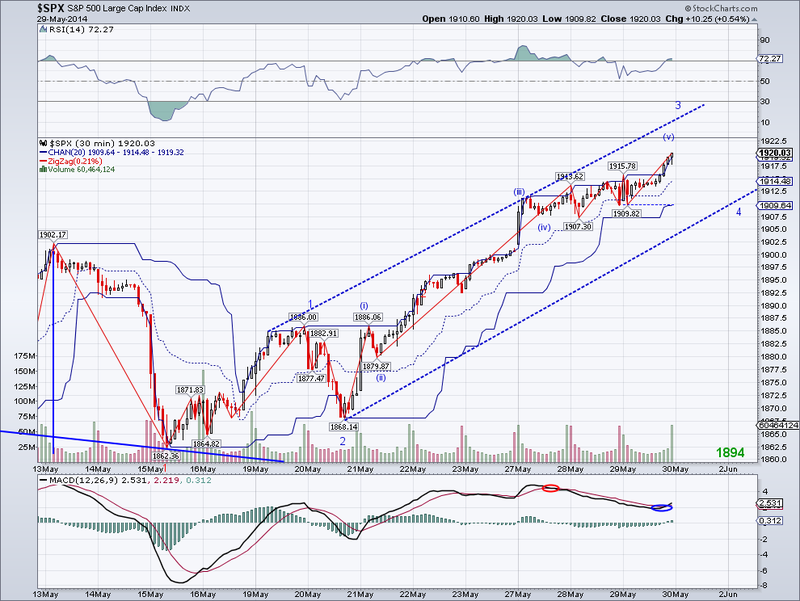 Lastly, the market recaptured the TA so let's see if we finally see some bullish follow through. I added longs near the lows so I am now 100% long again. I would have gotten a better price if I had been awake when 1859 was tested but I was busy dreaming of Lana Del Rey.. literally. The market failed to gather strength to rally as I had been expecting and instead it ended testing yesterday's low. It remains to be seen if the market will test the 50 DMA at 1864 or even the 1859 support level, however the market remains in a bullish set up as long as 1850.61 holds as a low despite the close under the Trend Average today. I am expecting a stronger bounce tomorrow but if that fails then it will be time to get defensive, specially at a bearish turn of the Short Term Trend. I ended position trading my longs and I sold my hedge at the end of the day. Hopefully, we'll get a better picture by the end of the current wave. "retrace back to at least 1870 and form a base to attempt another rally to take out the all time high once in for all"
I think there will be another challenge to the all time high again tomorrow unless something really bearish happens overnight. 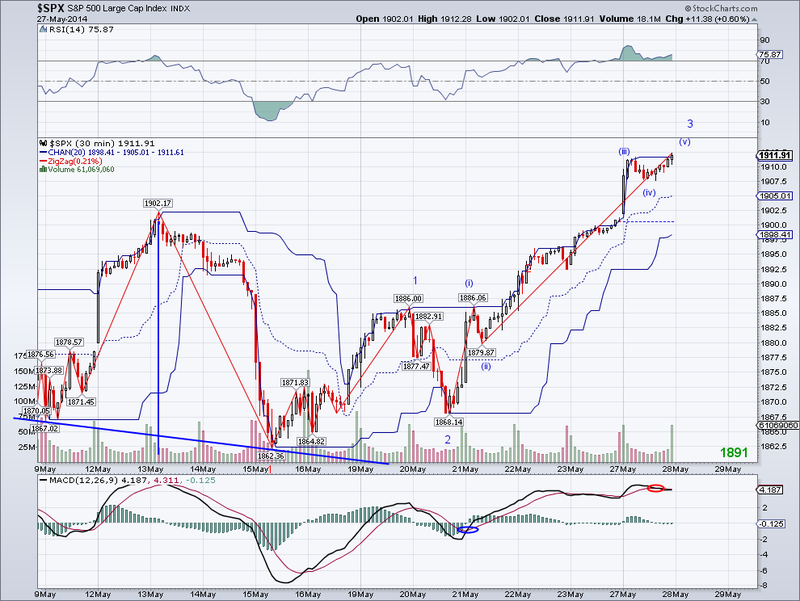 The patten as I've said before is bullish and trends continue to support higher prices. I am however keeping an eye on a possible rising wedge as you can see on the chart so any reversal at the top trend could set the market up for a sell off. 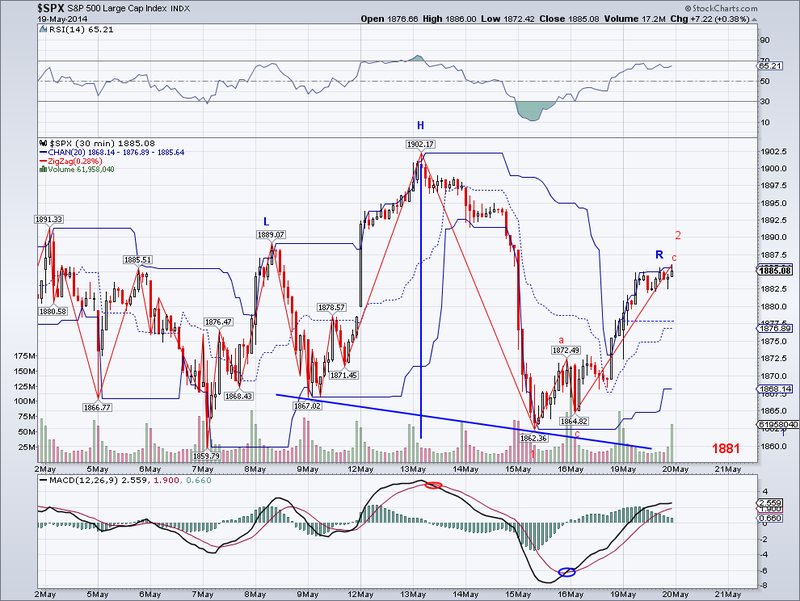 A breakout of the trend would imply this is a nested bullish 1-2 set up. My original plan was to sell my hedge at a low today but I was sleeping when the market was the low level and too high by the time I woke up. So I am keeping the hedge just in case as it's not that big of a position and I am looking to sell my longs from last week at the trend or at the end of a 5 count if that's what the market is planning to do. Last but not least, the ISM report is strong so I suspect whatever summer correction we get might be just to the 200 DMA. The market made an attempt at the all time high but it was reversed despite seemingly solid employment numbers. The waves are choppy but it doesn't mean they're bearish since key levels have been holding and one could make an argument of a sideways/time correction after the rally from 1850. So my guess is Monday we should see a move out of the recent range and start rallying or retrace back to at least 1870 and form a base to attempt another rally to take out the all time high once in for all. We still have the Russian issue in the background but as I said last week, Putin will take its time to make his moves so this will drag things out. Other than that, it is May so unless this year turns out different to others we might see highs but the summer correction will start in the next few weeks and so will the Int LT W4 that was supposed to start back in November at 1790. The bullish signal on the Long Term Trend has been in place since February 2012 so the market could use a break and hopefully we'll be able to anticipate the the trend change. I'd love to pick up some stocks cheap on a strong correction. I am holding to my longs but added VXX as hedge just in case.. Have a great weekend! 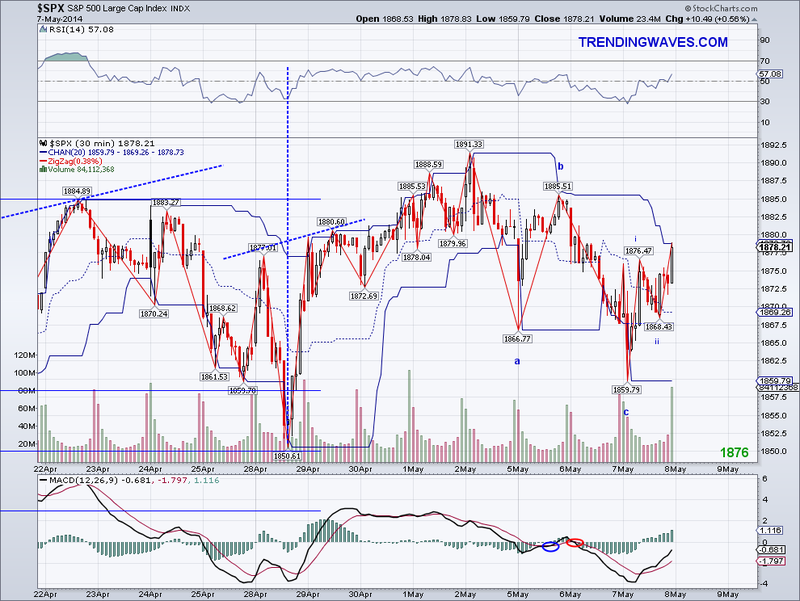 The market managed to make another high for this wave today but settled back below resistance. It seems like it is waiting for a good excuse to make a stronger move and my guess is tomorrow's job report will do the trick. I suspect we are in a situation where bad numbers will be considered good and strong numbers will also be considered good considering the market barely reacted to yesterday's flat growth announcement for the first quarter. The pattern is obviously bullish and is looking for a break out. The bears failed to make their case couple of weeks ago and now it's the bulls turn to make theirs.